Alvin had been swimming for the past two days. But, he hardly felt exhausted. His heart was burdened with grief though. He had lost his ship and the entire crew to the devastating storm. His captain as among the last to fall. Alvin could still see his best mates, old hands and some new crew members struggling for their lives. He thought that he was going to die too, but was just briefly unconscious. He cursed his strong constitution and his fighting spirit. Land at last! He could see sailors on the shore as sun sparkled in the sea. All he had to do was swim for a few more minutes. Alvin could feel conflicting emotions war within him as he took a deep breath. 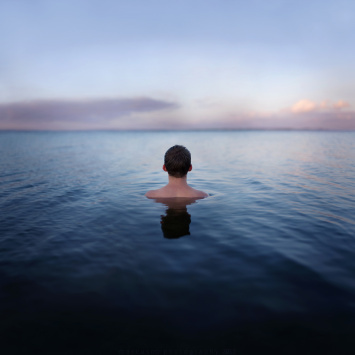 He forced his body to be still and sank deep into the sea. I wonder what forced him to conclude everything this way? He swam for two days but when land was seen, he gave up. But then, well, I suppose I chronically start and stop projects all the time. Tho probably not one with such a dire conclusion. In all ways, loved it! This was certainly not the ending one would expect but guilt is a powerful emotion, is it not? hope he will conquer that feeling of negativity and swim to the shore. sadly, he decides to sink.. Interesting. I wrote a story called Walter’s World Record that this reminds me of a little. It seems like everyone in the comments wants him to keep fighting. I guess maybe with all the others who died, it would have been less in vain if Alvin had lived, but what do they care? They’re all dead. It does seem a little odd for someone of such strength to be overcome with guilt or whatever. Very provocative! Alvin does have the strength of character, but also some weaknesses. He has grown in the ship and somehow feels responsible for his friends. When he sees shore, he is overcome to feelings and makes a sudden decision..Thank you so much for taking the time to read, Anne. Have you published the story in blog or could it be found in any journal?